Mass media is a collective term for all the media technologies which helps in disseminating large chunks of information to a large group of audience at one time. The other term for this type of communication is mass communication. There are a number of stations or in other words, outlets through which these mass communication is processed. 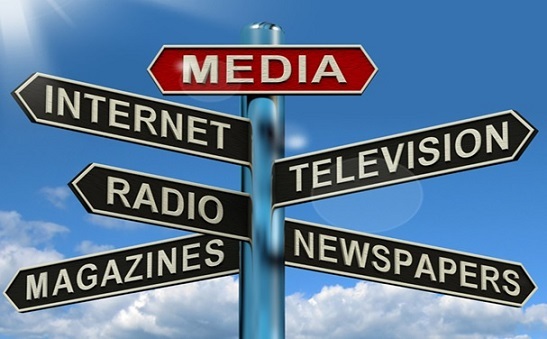 There are broadly five types of mass media: Broadcast media, Print Media, Internet media, Outdoor media and Public Media. What are the different forms of mass media? 1. Broadcast media: This form of media includes radio and television. The television and radio programs are distributed via common frequency bands using various ends of ranges, bandwidths, the types of receivers and transmitters. It is one of the most widely used form of mass media as the mediums of broadcast media, radio and television, both are found in abundance in every part and has become an integral part of our lives. Television and radio has become a source of information as well as entertainment for the people. Hence, making it a strong source for mass communication and disseminating messages to a larger audience in a short span of time. 2. Films: Another form of mass media is filmography. It is also called motion picture format. Films are considered a universal language for mass communication as a film educates, entertains, enlightens, change opinions of audiences and also inspires them. Films can be of different types, like a feature movie, fiction movie, non-fiction or documentary movie, animation movie and abstract movies. 4. Print Media: Print media is the oldest form of mass media. It consists of newspapers and magazines. Newspapers are a very effective form of mass communication as it reaches every part of the world, and doing it for more than a 100 years. Newspapers and magazines, both are one of the most trusted source of information and hence the messages directed in them influences the mass audiences very neatly and without any doubt or confusion. Newspapers are published daily, whereas magazines can be bi-weekly, weekly, monthly or bi-monthly. 5. Outdoor media: Outdoor media consists of signboards, billboards, placards, flyers, etc. Outdoor media has an advantage of their own. This type of media consists of short messages and interesting visuals compelling the readers and viewers to persuade on the first lookout. Long messages on a bill board or a signboard is only a waste, as the viewer has only about 5 to 7 seconds window to look and understand the message. Outdoor media is also very helpful in extremely poor towns and villages where access to any other media is not possible. Outdoor media acts as helping hand for them. What is the main purpose of mass media? Entertainment: In earlier times it was street plays, theatre plays, orchestra clubs and nowadays it their films, music, musicals, TV shows and the forms of mass media, all having the same purpose, that is entertaining the audience. Advocacy: Advocacy can involve both social references as well as business references. Advertising, Infotainment which is a mix of information and entertainment, marketing, political references and public relations. Public Service Announcements: These are basically emergency alerts or any other important service messages by government. As we know the concept of mass media is quite simple and easy to understand, but its working process is something that confuses the students very much. The assignments take longer than usual because of such diversity in this field. So, we are here to help you out. Our speciliased team of teachers and experts will do your homework, assignments and projects as you always wanted it to be. We guarantee best quality work from our part and also plagiarism free work, giving you 100% unique written work. Our work is also deadline guaranteed so you don’t have to worry about the deadlines, leave it that to us. We offer help in various fields of works from daily assignments to projects and models. Our team of experts are always ready to help you 24*7. 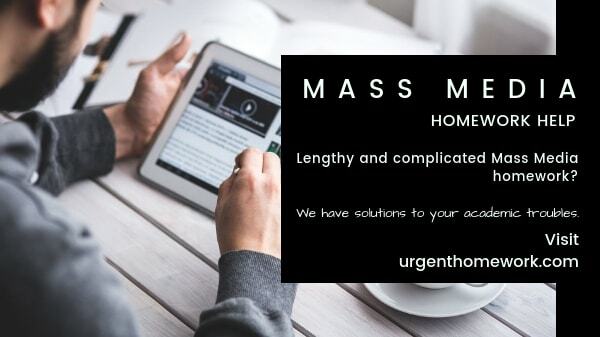 Contact us on our phone number or visit urgenthomework.com.